Durable bullet tip for consistent line width. Provides bold marks on most surfaces including cardboard, metal and plastic. Large size has a generous ink supply for extra long life. Permanent ink is quick drying, low-odor and rub resistant. Nontoxic; ACMI certified (conforms to ASTM D 4236). Black. Durable bullet tip for consistent line width. 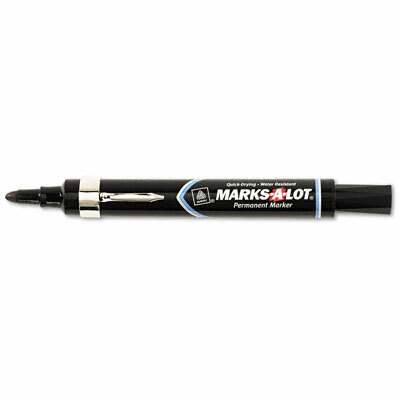 Provides bold marks on most surfaces including cardboard, metal and plastic. Large size has a generous ink supply for extra long life. Permanent ink is quick drying, low-odor and rub resistant. Sturdy metal pocket clip. Nontoxic; ACMI certified (conforms to ASTM D 4236). Black.